Grind peppercorns, cumin seed, coriander seed and allspice with a mortar and pestle (or in a spice grinder). In a blender, add ground spices, achiote paste, salt oregano, chiles, garlic, onion and liquids. Blend together. (It can be a little chunky.) Add bay leaves to the mixture. Score the pork with a knife, cutting holes into the meat on the top and bottom. Place meat in a non-reactive/glass bowl or a freezer bag. Pour red sauce over the meat and marinate for 2–3 hours, or overnight. Spoon some of the cooking juices onto the shredded meat while it is still hot for more flavor and color, to taste. 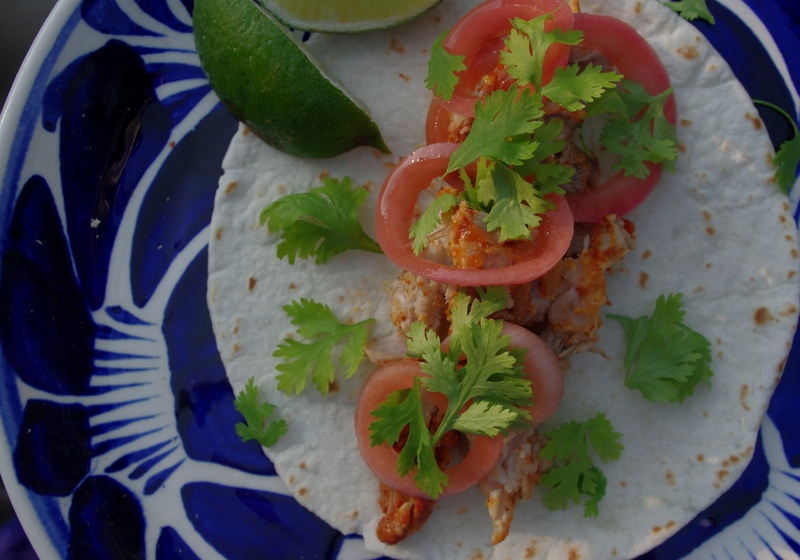 Serve with cebollas moradas encurtidas, chopped fresh cilantro and a squeeze of lime on soft tortillas. *NOTES: Achiote paste is made from ground achiote (annatto) seeds. It can be found at markets selling Mexican or Guatemala foods. Bitter (Seville) orange juice is produced by Goya and other purveyors of Latin foods. As a substitute, Diana Kennedy (the Julia Child of Mexican cooking) suggests blending 1 teaspoon finely grated fresh grapefruit rind, 3 tablespoons orange juice, 3 tablepoons grapefruit juice and 2 tablespoons lemon juice. This recipe works great in a slow cooker. Just thickly slice an onion and place it on the bottom of the crock. Set the pork on top of the onion slices, cover with all of the marinade and cook on low for 8 hours.